Should I wait till the 13" Pro/Air refresh, or is this a great deal? Discussion in 'MacBook Pro' started by aooga12, Apr 12, 2013. I'm just looking for something along the lines of a base 13 air/pro. I sent him an email asking for the condition, pics, boxing/accessories, why being sold. That MBP goes for $1,199.00 new on the Apple store, I would ask if you can buy apple care for it. If you can, than it is a good deal. But I would ask to have the sale's receipt, because at that price it might be stolen or a scam. At any rate, I only have $745 isn't applecare like 200? Or can I just get it for a few months at a time? Yeah, asking for PoP is a good idea too. Here's what I think it is, i've seen people list apple laptops for really low prices on here and I ask them why so low? They say they won it in a penny auction. If the seller provides you with the POP, you have 1 year from the day of purchase to buy the apple care. But you can't pay a few months at a time. 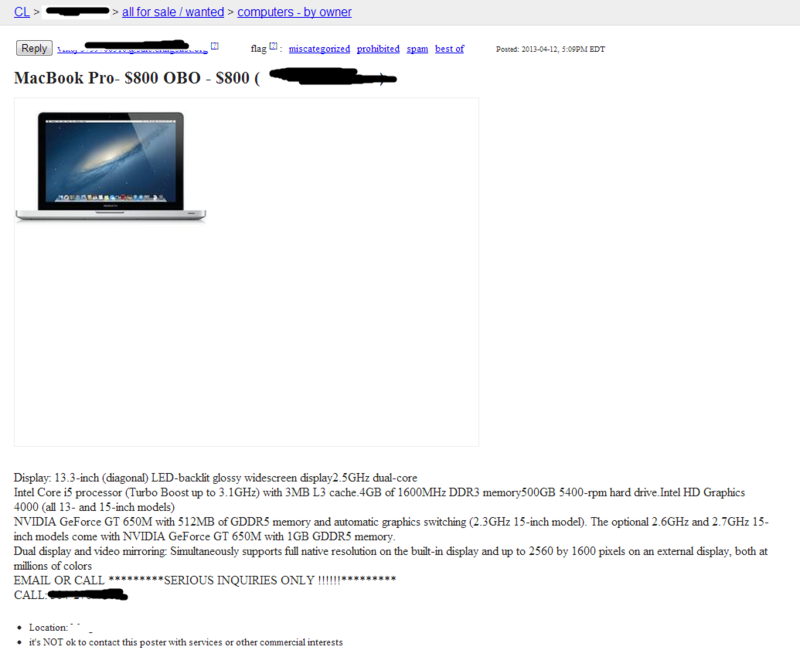 I don't know what a penny auction is, but if that laptop is the june 2012 model, 800$ is a very good price. Hence the POP. It can't be retina because it has a HDD instead of a ssd. A penny auction is like you buy your bids, and if you don't win the item, you don't get your bids back. But usually things go for super cheap compared to an ebay auction. so basically you gotta be lucky spamming bid in the last seconds. That's what I understand of it. Good because there are a lot of dishonest people selling things on the net.